Bettina Costa was born in Rosario (Argentina) in 1965. Autodidact, her talent shows the legacy of his father Aldo Costa (illustrator and painter). She lives in Switzerland since 2001. Her journey as plastic artist began in Argentina with a realistic style, strongly marked by the conflict between what she believed she should paint and what she wanted to paint. The abstract world called her, and the understanding that a painting does not necessarily need to be exactly like the reality it represents, gave her wings to fly into the world of the abstraction. Rough terrain, sinuous and complex; the multiple layers covering her abstract works (paper, plaster, acrylic) invite the observer to discover and perceive a world full of shapes, colours, lights and shadows. 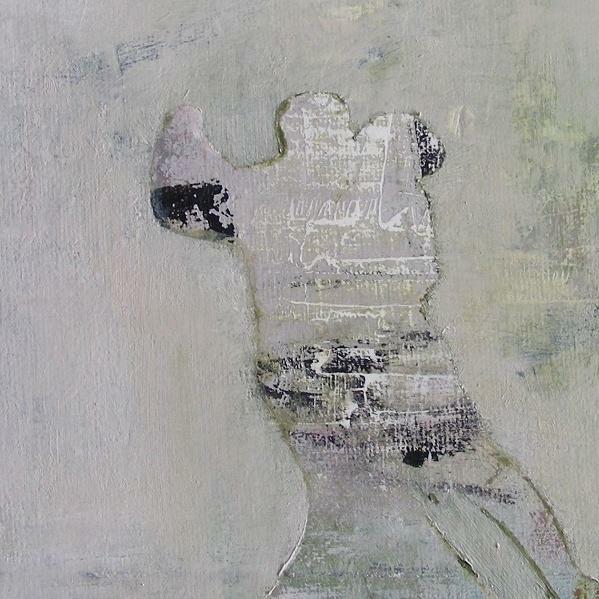 The nostalgia for her homeland makes her appeal to a new theme “Tango”; connecting thread of her current works, the “Tango Series”. With a personal technique, using collage and acrylic, the artist manages to bring together movement, passion and music, she overlaps suggestive images, harmonic and contrasting colours, which act with even intensity on the surface of the paper and on the feelings of the observer. Bettina’s works invite us to travel to Argentina, to feel the magic of tango; sensual and popular dance, human figures, anonymous persons moving to the beat, tight embraced bodies, thoughts drifting into the distance, squinted eyes, legs that caress and entwine. Music that penetrates the soul and leaves the body as movement. Her works invite us to dance.